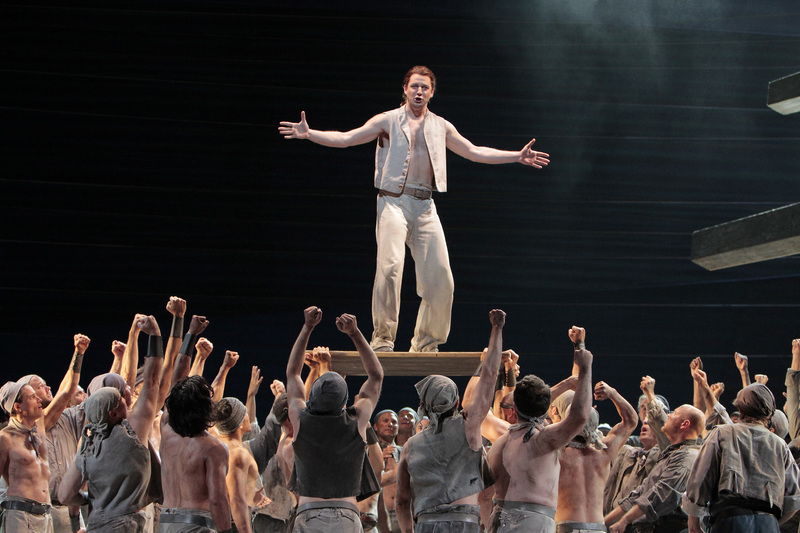 With its large cast and orchestra, Billy Budd is the largest scaled of Britten’s operas, and the composer, a master of orchestration and choral writing, deploys his massive forces with remarkable dexterity. From the opening notes of the prologue, Britten gives rich musical support to the action on the stage. Listen for the slowly drifting muted strings and ambiguous tonalities at the beginning of both the prologue and epilogue, creating a hazy, uncertain atmosphere as the now-retired Captain Vere gazes back into the distant past. Contrast the intimacy of those scenes with the thrilling choral writing that opens Act Two, as the excited crew prepares to engage the distant French ship in battle. Billy’s one imperfection, his stammer, is musically illustrated with flickering winds and woodblock, first heard—before we even meet Billy—in the prologue as Captain Vere reflects that “the good is never perfect.” This arresting combination recurs at several critical moments to heighten the anxiety of Billy’s sporadic loss of control. bass, of course—is colored by murky scoring for the lowest winds and brass. When Captain Vere informs Billy that he is to be executed, their meeting occurs out of view. The music heard here, as the audience gazes at Vere’s empty cabin, is riveting, a sequence of 34 major and minor triads played slowly, one after the other. These so-called “interview chords” are introduced by the full orchestra but soon begin to alternate between four different sections: strings, woodwinds, horns and the other brass instruments. Suggesting a wordless dialogue and range of emotions, this compelling sequence forces the listener to imagine the unseen meeting as the captain, fully aware of Billy’s innocence, conveys the unalterable sentence. (“Look! Through the port comes the moonlight astray”). Tender and unsentimental, it almost sounds like a lullaby, with gently rocking strings under the simple tune; in fact, it reprises music heard earlier, when the dreaming Billy is awakened in his hammock by the Novice.